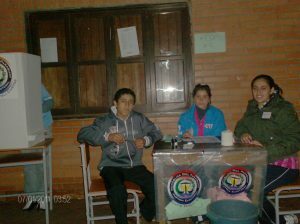 My name is Jonathan William Rosario and I served as an Education and Youth Development Volunteer in Paraguay from 2011 � 2013. Why did you choose to serve as a Peace Corps Volunteer? During my senior year as an undergraduate student at Western Connecticut State University, I still did not know what direction I wanted my life to take. All I knew for sure was that I had a responsibility to help the underprivileged. I also had a desire to see the world as it really exists; I was not content to see the world through the filter of television, the internet, or books. The reality of Peace Corps life worried me, however. I had no idea where I would be placed or under what conditions I would live for two years. As a result, I procrastinated on submitting my Peace Corps application after I graduated. I worked odd jobs for about a year before I had the courage to submit my application, which wound up being the best decision I have ever made in my life. What did you do as a Peace Corps Volunteer? I worked in a local public library, helping the librarian develop�various�ways to increase membership and to bring increased visibility to the library. We turned the library into a community center instead of solely a place for students to conduct research. 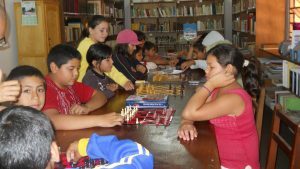 Our most successful transition from library to community center was the establishment of a chess club and annual chess tournament.�I also helped to expand the physical space of the library to about double its former size through the Peace Corps Partnership Project. I worked with a teenage youth group and helped train them in project design and management so that they would have the skills necessary to carry out their own projects in the future. I also advised the group on the establishment of student governments in four area high schools. 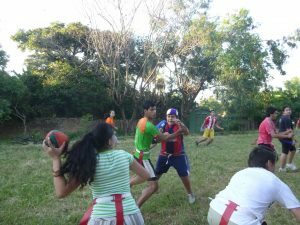 I also held a two-week English camp and a two-week flag football camp for the youth of my community. Can you share your favorite memory from service? 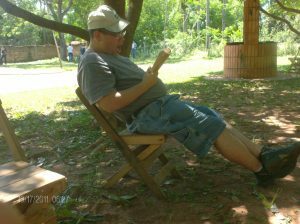 I have two favorite memories of my time in Paraguay, neither of which actually involved any work. 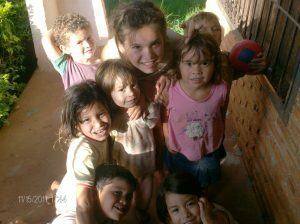 What I will always remember and carry with me are the relationships that I formed with the community, specifically my host family in site. They went above and beyond what a host family is expected to provide. They really took me in as one of their own and treated me as a member of the family. 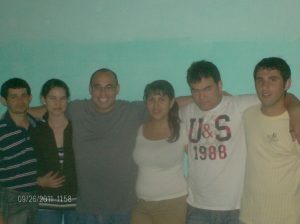 To this day I keep in contact with my host brother, and through him his family. The other cherished memory I have is of my neighbors� kids. Curious as they were, they would stop by my house and just watch through the open window to see what the weird American was up to. This turned into me entertaining them at my house on weekends. With their parents� permission, I invited them into my home to watch Disney movies in Spanish. I always made sure to have them wash their hands properly using soap and water; I would make them stovetop popcorn (one time I even made pancakes); and we would enjoy Spanish cartoons on my laptop. Their favorite was La Bella y la Bestia (Beauty and the Beast). How has serving as a Peace Corps Volunteer affected your life? The Peace Corps opened my eyes to the true beauty that exists in this world. The people I lived with did not have much money and most did not have running water. But that did not stop them from enjoying the simple pleasures in life; sharing drinks with friends, swapping town gossip with one another, or enjoying a nice barbecue on special occasions. Serving as a Peace Corps Volunteer also helped guide my career interests. After my service ended, I studied Economic and Political Development at Columbia University�s School of International and Public Affairs. Had I not served in the Peace Corps, there is a good chance I would not have grown as much as I did. I will forever be grateful to the people of Paraguay for welcoming me into their lives and their hearts. What advice do you have for prospective Peace Corps Volunteers? I have plenty of advice to offer prospective Peace Corps Volunteers, but in the interest of time, I will simply say this: When you get a chance, find a quiet place, close your eyes, and let your heart guide your imagination. There is so much good in this world and it far outweighs the bad. If you believe in your heart that you can positively effect change in this world, then please consider doing so.